Totally love the pink parasol! Weddings and party planning are popular here at ALB. They go out of date quickly and at the same time they give us a great glimpse into the past. Yes, they need to be preserved, just not at a public library. My idea for unexpected guests is ordering a pizza but this idea works well too. 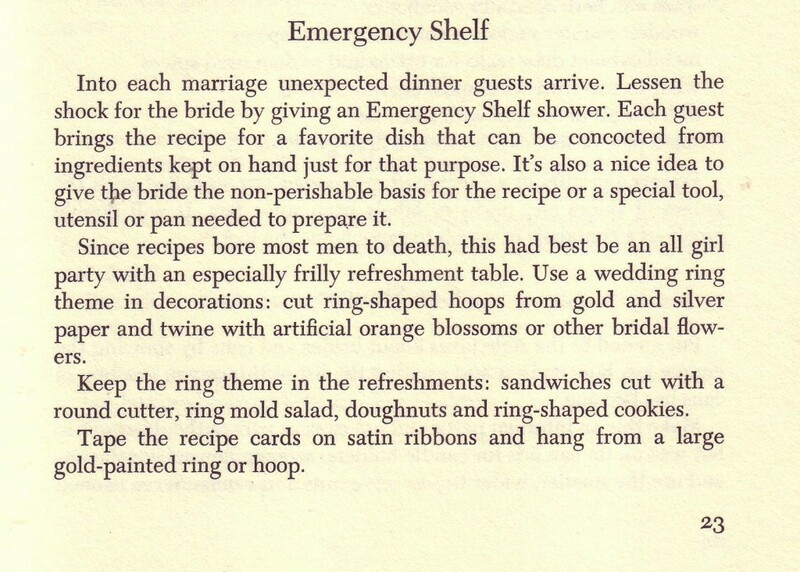 I am concerned that a bride would go into shock at such an event. 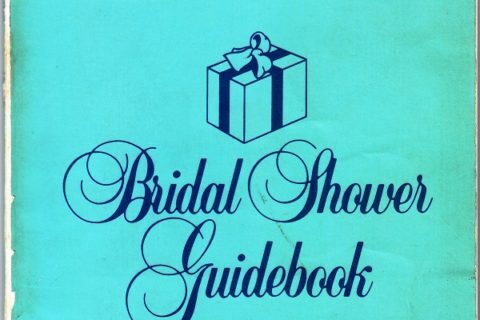 Best part of this book: throwing your brother, nephew or son a bachelor party. I am curious on the etiquette of paying for strippers and such. Gotta say I am loving all this wedding stuff as I prepare for my future role as mother of the groom. I am still concerned that my future daughter-in-law has no idea what marrying into our family actually entails. Personally, I believe alcohol was invented to make family events more tolerable. Wait — I want to see the page for Spinster Dinner. That’s a new one. What on earth is a “Spinster Dinner”? I kind of want to know what a “Spinster Dinner” is. We had not one by two copies of this gem on our shelves. 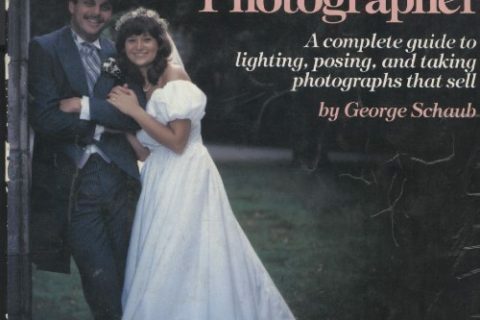 I’ve been trying to get that area weeded, but some of the older staff are having a very hard time letting go of books that helped them to plan their weddings! So wait, this bachelor party is serving sandwiches and dip & chips, but they don’t want the men to have to “cope” with plates? Do they expect them to stand around the table like at a trough, dropping sandwich crumbs everywhere and double-dipping in the dip? Seems like that creates far more mess. That’s a parasol? My first thought was some shower game where you attached massive pompoms to the bride’s head…then I wondered whether she might be ducking under a very fluffy disco ball of some sort. Watch your head, dear! 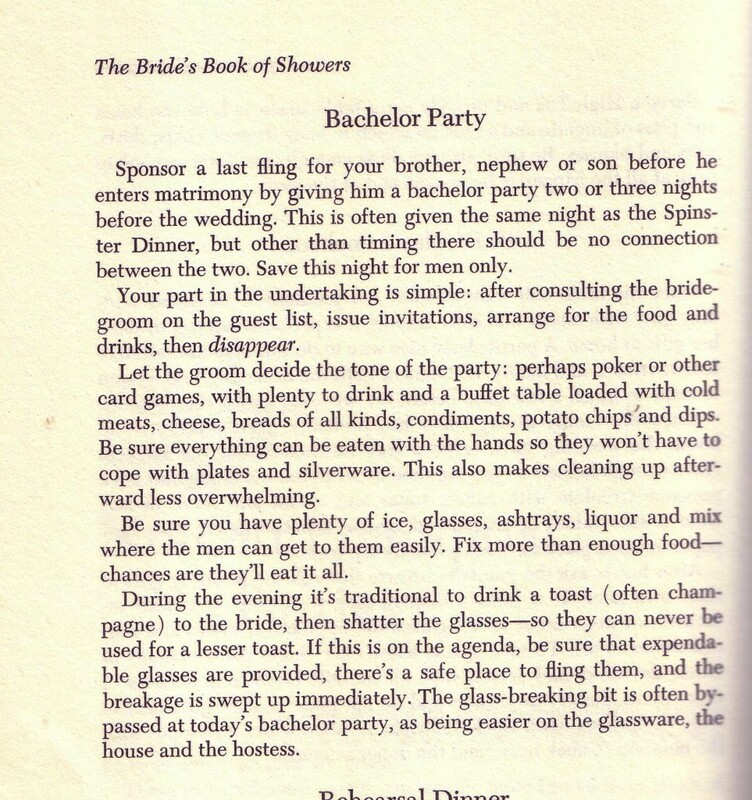 I have recently learned about the UK term of “hen night,” but I might switch my loyalties to “Spinster Dinner” instead. “[R]ecipes bore most men to death,” huh? Funny, my husband has been the one who’s asked for the cookbooks with the most elaborate recipes. And I’m thankful I don’t have so many guests, surprise or otherwise, that I need an Emergency Shelf full of non-perishables and bakeware just in case yet another surprise guest stops by that night. It’s a UFO!! Where’s Keyhoe!? Given the “we’re men, we don’t cook and clean” tone it seems to have, the bit about breaking the glasses seems oddly sentimental. It’s frivolous and unnecessary, but kind of sweet. I just know I’m going to have nightmares about her shoes. They look like my grandmother’s naugahyde recliner. Isn’t a spinster dinner just what I eat every evening, being a spinster and all? @Leigha: Sure, if the guys actually break the glasses for the reason stated, sweet. Most guys (um, people of any gender….) I know would be more inclined to think “Hey! THROWING! BREAKING! SANCTIONED! WHEE!” I know I would… as long as I wasn’t the one cleaning up. From what I can gather looking around the Web, it appears that “Spinster Dinner” is what they used to call bachelorette parties, with the bride and her bridesmaids. Maybe it is actually the “Last Supper for the Spinster,” because she’s getting married the next day? 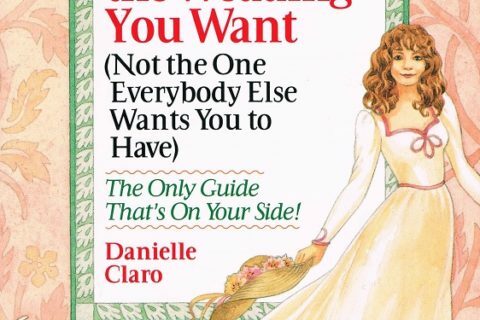 Or is it to make the other single girls in the wedding party feel bad? Maybe I should make all of my meals as finger foods so my husband and son don’t have to cope with silverware and plates. After all, those are complex concepts a man can’t understand. Better still, I should save my stale bread and use them as trenchers and serve the food on them so they can eat the plates. Open WordStar comments or I’ll fling a rainbow trail star at you!!! I thought the parasol was a hat, so you are all ahead of me. Just attended a librarian wine drinking/pumpkin carving party. We carved first in case you’re wondering. I bet that’s not covered in the book, and I think there were a few spinsters. I was afraid that pink thing was a hat! And who needs a Spinster Dinner when you can have a Bachelorette Party?